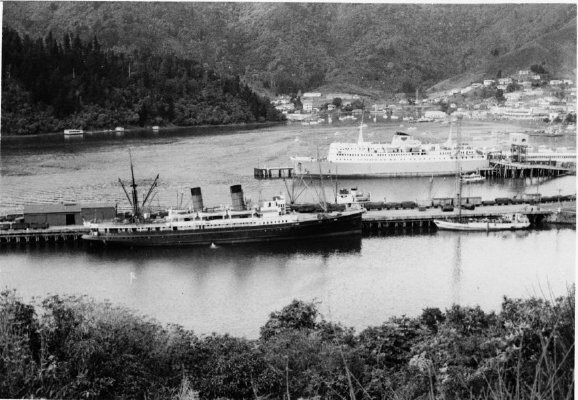 Description A black and white photograph showing the ferry Aramoana at the new roll-on roll-off wharf and the ship Tamahine at Waitohi wharf, Picton. Aramoana made its first crossing of Cook Strait on 11 August 1962 [source: Archives. Hale Clear File Folders index, volume 2, page 149a]. This is a Norm Brayshaw copy, but the typed information on card has been separated or lost. There is no negative. This 1962 view shows the Tamahine tethered at her traditional berth on Waitohi wharf. Behind is the brand new, 'roll on - roll off', Aramoana at her new wharf. The linkspan's overhead hoisting gear shed and the curved ramp to the upper vehicle deck can be seen.